When Janesville, Wisconsin, lost its GM plant, residents had to band together and sacrifice. Janesville’s General Motors plant was the keystone of their economy, and rebounding from its 2008 closure has been a long journey. Over the past decade, stories of auto plant closures have become unnervingly common, but often they’re reduced to statistics about unemployment and the number of jobs leaving a city. Janesville, Wisconsin, is one of these cities: Its General Motors plant largely shuttered in December 2008 (closing for good in April 2009) and Rock County lost approximately 9,000 jobs between 2008 and 2009. 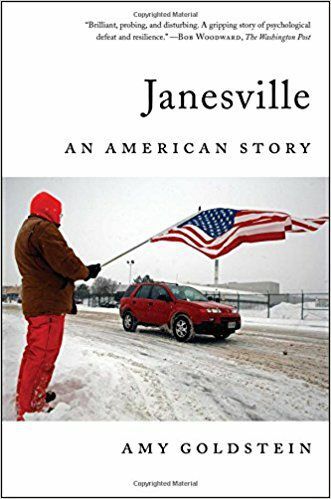 But writer Amy Goldstein didn’t want to simply give a flyover view of Janesville’s struggles, and in her new book, Janesville: An American Story, she sought to capture deeply personal stories of hardship, as well as of the resiliency shown by Janesville residents. “My basic idea was to try to create a kaleidoscope, so you would see from different vantage points what this dramatic loss of jobs looked like from different peoples’ perspectives,” Goldstein tells Vox critic at large Todd VanDerWerff on the latest episode of his podcast, I Think You’re Interesting. VanDerWerff asks Goldstein what she feels we miss when we talk about these kinds of stories from a purely statistical standpoint. To capture that feeling in Janesville, Goldstein split the book up into 55 very short chapters that focused on a single scene in the lives of specific residents. One of these characters was Matt Wopat, who decided to start commuting to Indiana for work in order to keep his family in Janesville. But in addition to capturing the powerful stories of personal sacrifice that accompanied the plant closing, Goldstein made sure to also focus on the resolve and resourcefulness of Janesville residents, as well as its institutions — in particular a technical college that focuses on vocational training. Janesville: An American Story is available now. After that, Goldstein wanted to look at the impact of these retraining efforts on Janesville residents. But she also found the relative definition of success in the face of the GM plant closing to be quite fascinating, and in the book writes about a couple who went through retraining and remained in Janesville. Listen to the full episode for more with Goldstein about how the plant closure affected Janesville’s other businesses, how Janesville voted in the 2016 presidential election, and what working on the book taught Goldstein about journalism. To hear more interviews with fascinating people from the world of arts and culture — from powerful showrunners to web series creators to documentary filmmakers — check out the I Think You’re Interesting archives. One of these characters was Matt Wopat, who decided to start commuting to Indiana for work in order to keep his family in Janesville.